If there’s one thing I like about Earle Swensen’s, it’s how often they invent new ways to please our palates. Every so often, new items appear on the menu, tagged with the little “new” logo that promises that your meals there never have to be the same every time. Their exciting new June menu is no exception with four appetizers, 11 new mains and three desserts.While all of these items feel like they are worth a try, June and I can only eat so much in one sitting, and thus we had to make some rather difficult choices. For starters, the Breaded Scallops with Wasabi Tar-Tar Sauce and the Sesame Sriracha Fried Drumlets. The Breaded Scallops with Wasabi Tar-Tar Sauce are a great opener to any meal. While I’m not usually a fan of seafood, I found them very enjoyable, with their crispy crust revealing the softness of the scallop indie. What makes this dish really stand out is the wasabi tar-tar sauce. For those who can’t handle the kick of wasabi, don’t worry as the sauce brings about the flavor without making you wriggle like a worm in pain after each bite. The wasabi tar-tar sauce was so nice that I ended up dipping the Sesame Sriracha Fried Drumlets in it too. 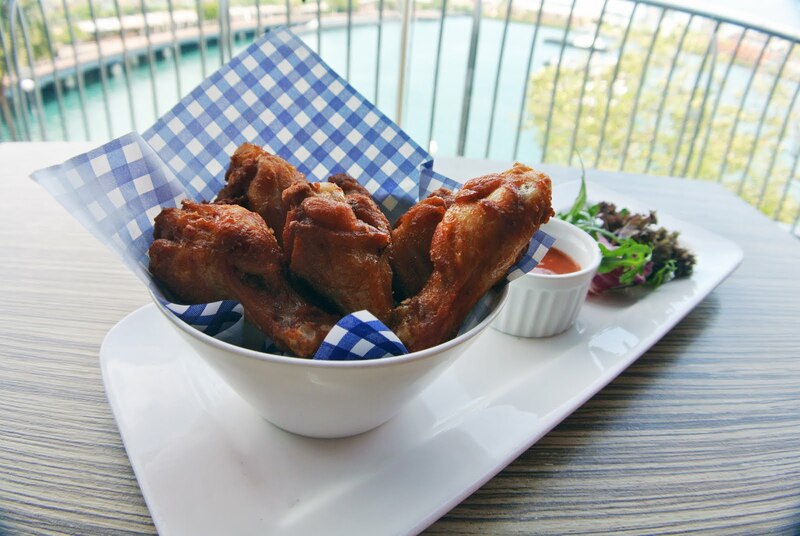 The drumlets can stand their own too, soft and juicy with a tingly spicy end note that will have you coming back for more. If you prefer having more of a kick, dip them in the sweet and spicy sesame sriracha sauce, while it was a bit too hot for me, it will not disappoint the spicy lovers out there! For the mains, the carnivore in me chose the Charbroiled Ribeye Steak and Earle’s Surf & Turf. The Crispy Skin Barramundi in Orange Basil Sauce was also too tempting not to try. 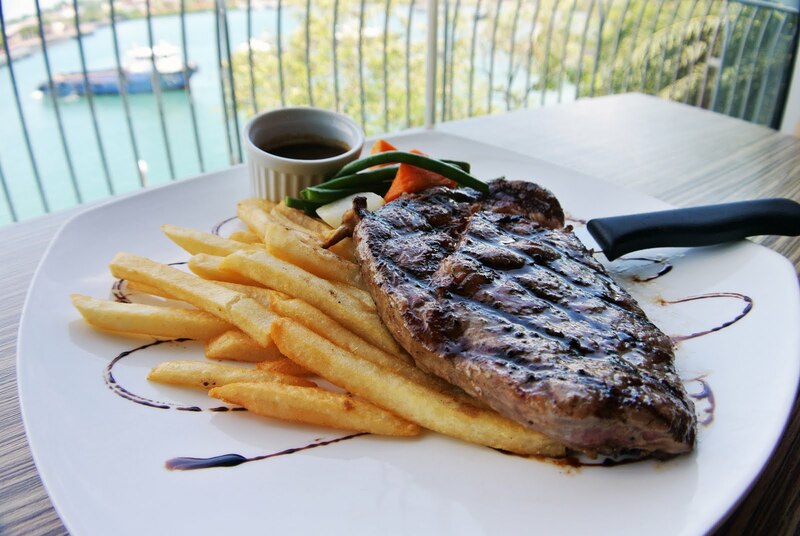 Earle Swensen’s is no stranger to meat, but they usually carry only minute steaks, which are hard to cook properly medium-rare due to their thinness. I was very happy to see that the ribeye was thicker than their usual cuts. The extra thickness meant that I did not only get a nicely medium rare steak, but also each bit was juicier and had a satisfying bite. The only let-down was that the meat did not have the charcoal smoke flavor of the grill. Earle’s Surf & Turf came up next. 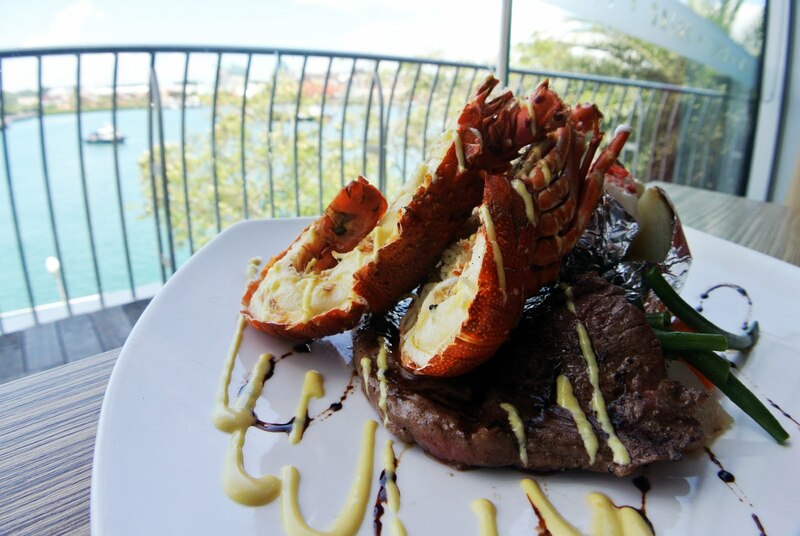 With a nice-sized lobster sitting on a minute steak, this is the best dish for those who can’t decide between seafood and meat. As I stated before, I am not a seafood fan, and I found the lobster rather plain in flavor, and a bit dry. The steak, however, totally made up for its sea friend in terms of taste. 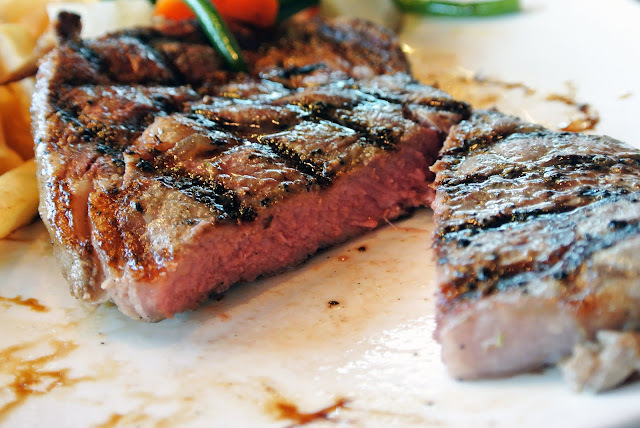 The chef expertly cooked it spot on medium rare, and the meat was tenderer than the charbroiled ribeye. Each slightly chewy bite was juicy, with a slight butter taste that only made the experience more enjoyable. We finished the mains with the Crispy Skin Barramundi in Orange Basil Sauce. 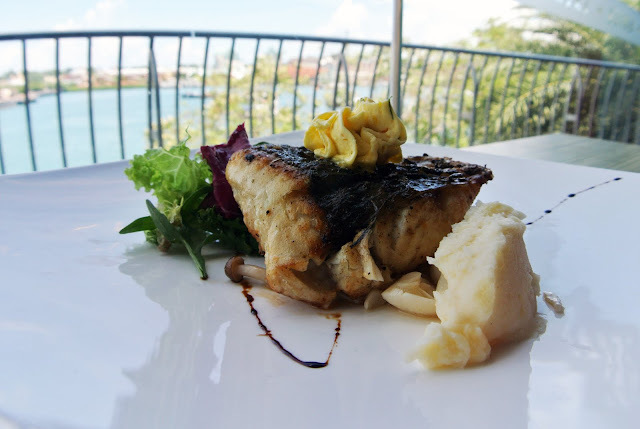 The firm flesh of the barramundi was satisfying to bite on, and while this fish is known for its light taste, the chef knew just how to make it more exciting – the orange basil sauce. Without the sauce this dish is all right, but with it, it becomes a treat! The sweet and refreshing sauce matches up so well with the fish that it left me wishing there was more. The coup de grâce of this glorious meal was brought by the Millefeuille with Seasonal Fruits and Gelato. I just loved the presentation, yet when I had to take pictures of the contraption and the ice cream started melting, I realized just how tricky it must have been for the chef to pile up the ice cream and pastry fast enough for it to be served before it collapsed.My word of advice is to not hesitate and bring the sweet cathedral down like a bulldozer on a rampage before digging in. While you can choose the ice cream flavors of your choice, I recommend sticking to the original assortment of cookies and cream, mint with chocolate chips, strawberry and chocolate. 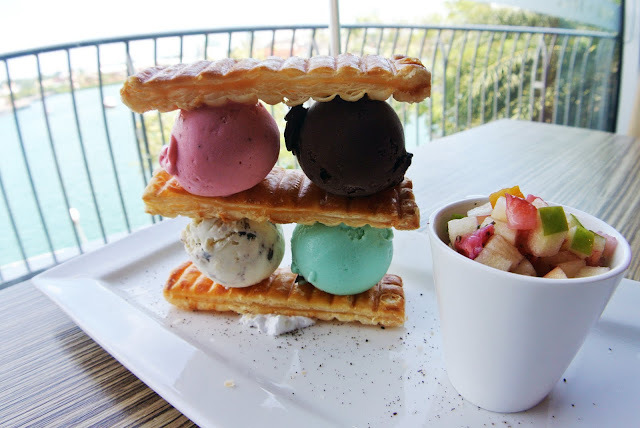 The puff pastry failed to get my attention, but mixing the apple and mint fruit salad with the ice cream makes for a delicious sweet and crunchy note to end a great meal. 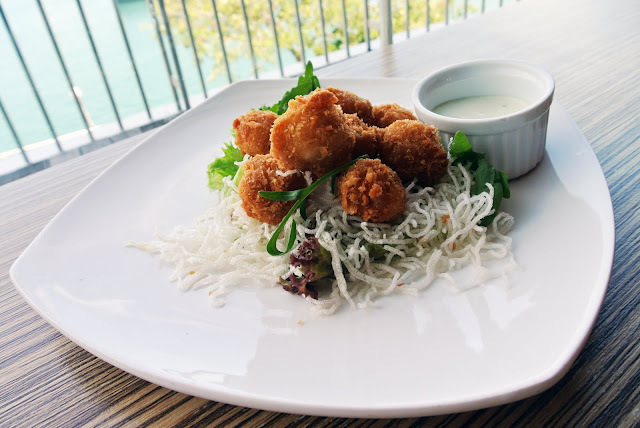 These dishes only represent a part of the new items on the menu, and I would recommend you to head out to Earle Swensen’s to give them a try. I know I already have my sights on the Kalbi Beef Ribs, the Raspberry Sriracha Smoked Duck and the Lamb Stew for my next visit!